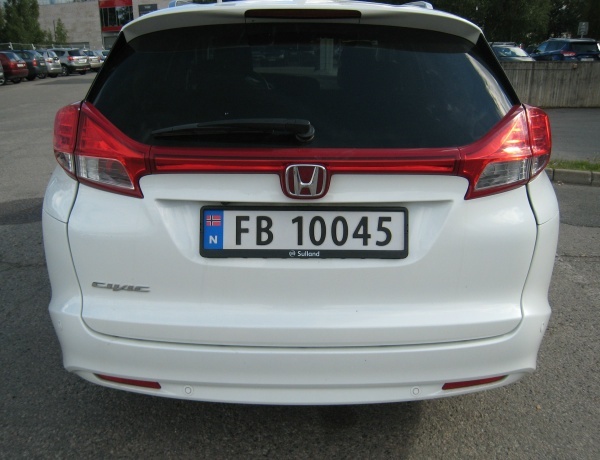 These are highest sightings of normal series plates. Since 2009 white, green and other colour plates are no longer in separate blocks. The archive is now updated for end of 2018. Since 2012 aluminium plates in 2006 style are again used. They are shown in normal lettering. Plastic plates in 2009 style are shown in bold lettering. Aluminium plates in 2002 style in italic lettering. Aluminium plates in 1971 style (reflective since 1982) in underlined lettering. 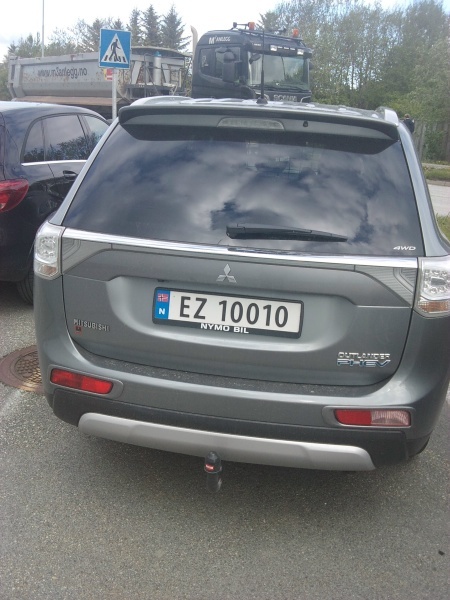 Elverum HB 84247 84245 17.2.19 FZ up to at least 10079 registered by mistake since June 2015. 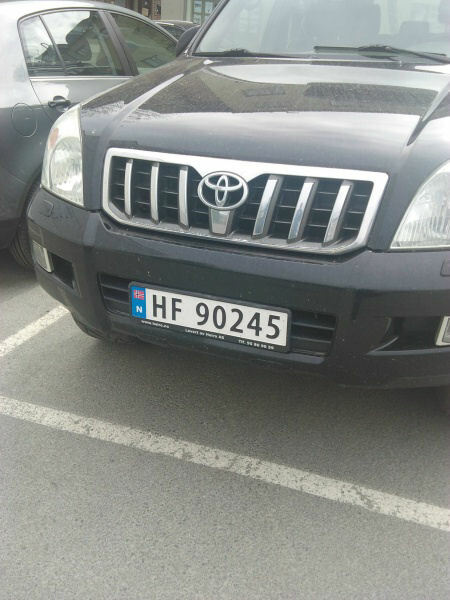 Tynset HF 28371 28256 21.12.18 HF 90245 registered in 2006. (Photo: Kim Andersen). FB up to at least 10098 (green plate) registered by mistake since June 2015. HYDROGEN HY 10412 10392 16.4.19 First of the HY-series. Porsgrunn NN 18060 18054 Late 1980s Obsolete since 1974. Highest issued at least NN 18126. Egersund RZ 42000 41797 9.1.19 RZ 71711 registered in 2006 to a 1971 Chevrolet Monte Carlo. 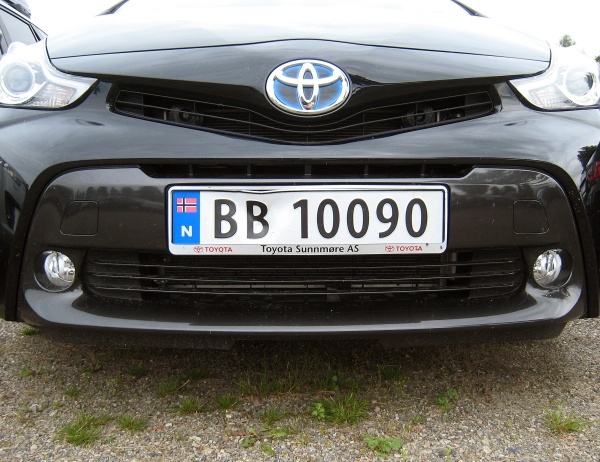 Ørsta UN 38832 38343 20.4.19 BB up to at least 10090 registered by mistake since June 2015. 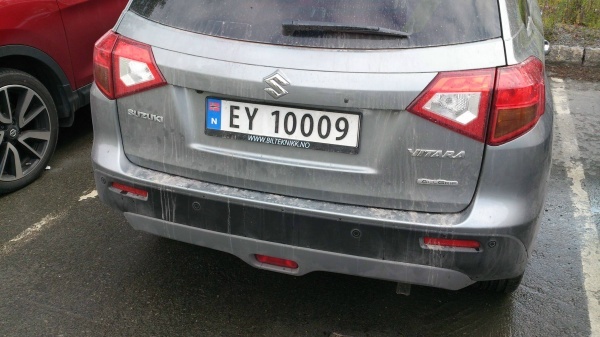 Trondheim issued from VP 10000 to 10089 because of a mistake by the plate manufacturer in November 2001. 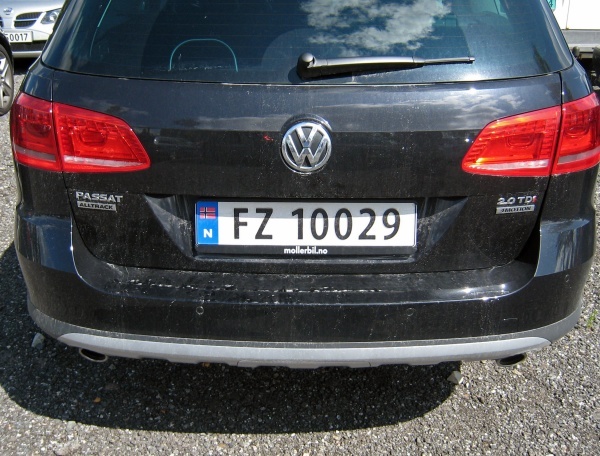 Støren VT 20279 20223 17.4.19 Støren issued some VS plates from August 2006 before returning to VT.
Levanger commenced issues from XL 10000, but from 1.1.2002 XK has been used. XL reached just above 36000. Mosjøen XV 71012 71007 20.8.18 XV 72340 registered in 2011 to a 1972 Dodge Challenger. FA up to at least 10085 registered by mistake since June 2015. 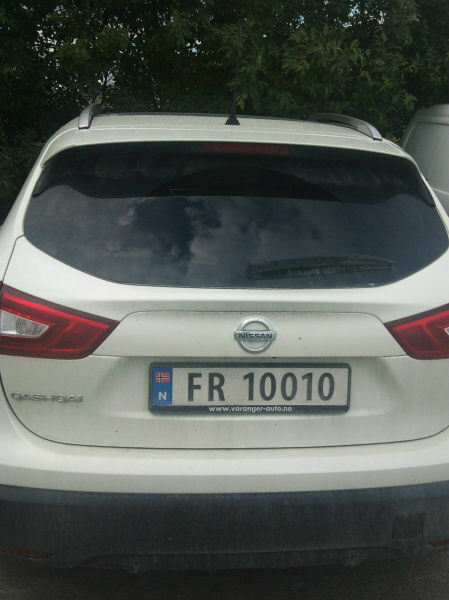 EZ 10010 registered 11.6.2015 by mistake. Plates up to at least 10173 (green) have been issued. Svolvær YT 73660 73657 25.8.18 YT 80000 registered in 2014 to a 1980 Chevrolet. YT 74142 registered in 2017 to a 1974 Volvo 142. News article about YZ 99999 and ZA 10000. 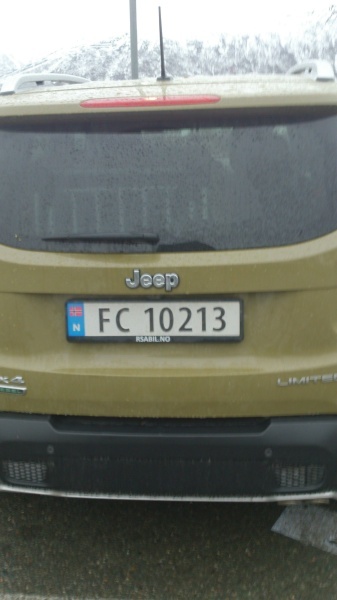 FC up to at least 10213 registered by mistake since June 2015. See news article about FC 10170. 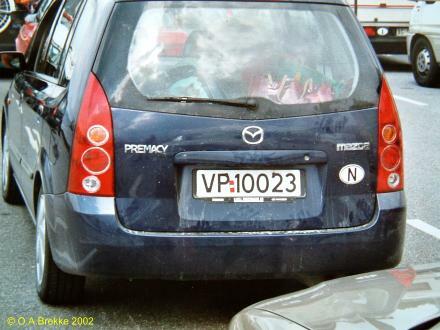 Square ZD 99069 in 2002-style registered 15.7.2004. Finnsnes issued from ZD 10000 to 10010 from 27.11.2001, probably by mistake. After reaching ZF 99999 in May 2004, ZD continued. EX up to at least 10006 registered by mistake since June 2015. 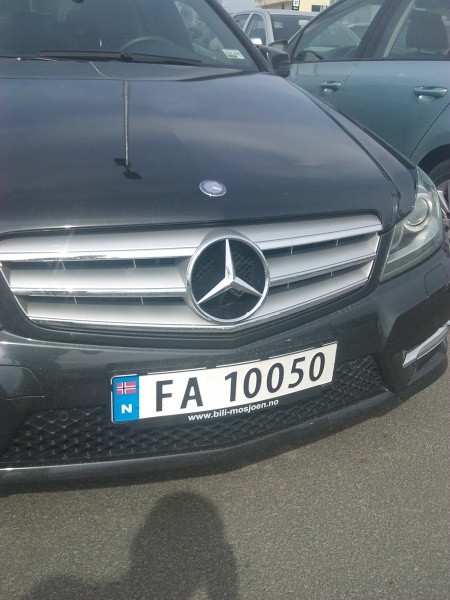 Vadsø ZP 47291 47241 30.7.18 FR up to at least 10029 registered by mistake since June 2015. Kirkenes ZS 23840 23821 20.3.19 EY up to at least 10009 registered by mistake since June 2015. Thanks to the following for contributing in 2019: Erik Einum, Lars Ihle, Helge Fjelltun, Vegar Norheim, Stig Carlsson, Stein Arild Berg, Geir Arild Hustad, Jens Ståle Hanem, Jon Arild Skedsmo, Cato Stenmark, Lars Vermundsberget, Geir Midtun, Arne Meyer, Johan Xt. Olsen, Lars Vollan, Kim Håvard Andersen, Frode Samuelsen, Harald Johansen, Alf-Tore Kirkeli, Arild Gill, Anders Lien, Tore Fagerli, Lars Aage Svendsen and Øyvind Taraldset Sørensen. Harstad (YZ) jumped from 45925 to 89920 because of a new computer system. Similar situations occured in Setesdal (PL), Stavanger (RH/RJ), Mosjøen (XV), Mo i Rana (YA), Fauske (YK), Svolvær (YT), Tromsø (ZE), Finnsnes (ZF), Storslett (FK), Vadsø (ZP) and Kirkenes (ZS). Skien (NE) skipped around 30 000, Steinkjer (XD) around 3000, Stjørdal (XN) around 4000 and Narvik (YN) around 4000 numbers previously reserved for green plates. Since October 2001 a new centralized computer system is in use. The use of large separate blocks of numbers for green plates has been abandoned and all issues have jumped ahead to the highest series. For example Harstad jumped ahead from YZ 45924 to the end of YZ 89900. Have you seen any higher? Contact Olavsplates and I will include them in the list.